Our class is the first and only class to date to create an Alumni Scholarship award. Thanks to Jennifer Devilbiss for coming up with the idea. We have used funds collected over the years from events and interest. In the future we would like to create an ongoing fund to continue to support the scholarship annually. The scholarship is given to a current child of a BHS alumnus (our only criterion) and it is selected by the scholarship committee at the high school. The reunion committee is looking into how to handle continuing this scholarship. Unless you are a non profit a bank account must be in a person's name. However, we've found that we could open an account with Greene Giving (wwww.greenegiving.org) and they would handle the account and disperse the money according to our wishes. Thanks Jennifer for handling this. Here are the four recipients to date. Beavercreek High School class of 1981 Alumni recipient, Cameron Mills is going to Wright State University majoring in psychology. Our third Alumni Scholarship award went to Jasmine Kroll who will be studying Music Education at Ohio University. 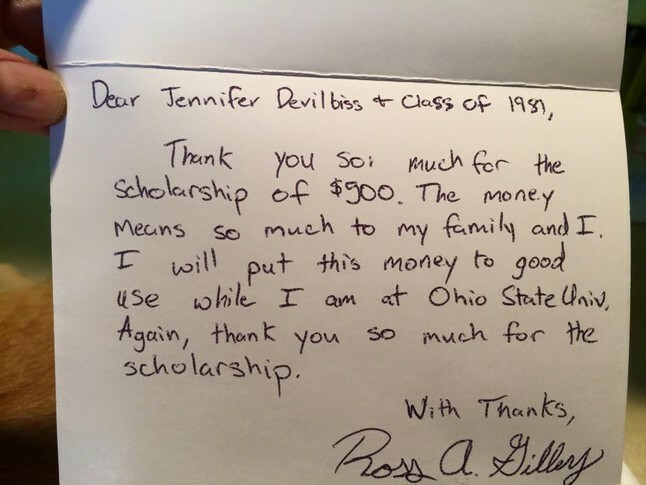 Once again our class gave a $500 scholarship to a 2015 Beavercreek High School senior. Ross Gilley was the recipient. He will be attending Ohio State. 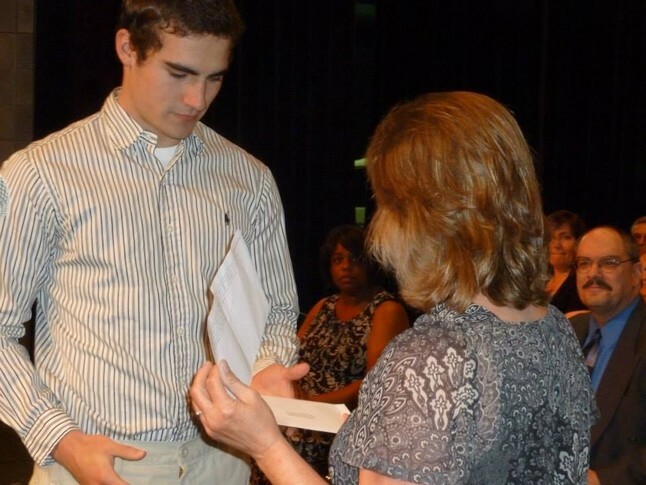 The BHS scholarship committee selected him to receive this scholarship as a child of a BHS alumnus. BHS Class 1981 Scholarship Award 2014. Jennifer Grinstead DeVilbiss presenting our class's first award of $500 to BHS senior Dean Ahrens (on May 19, 2014). He will be studying engineering next year at Miami University. The scholarship committee at the high school chose him to receive the award as the child of a BHS alumnus (our only criterion).